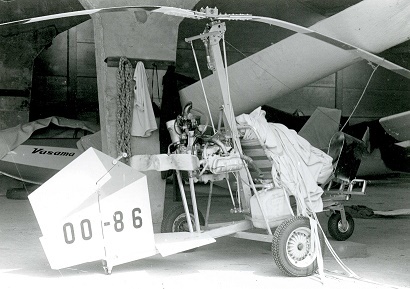 In 1954, Igor Bensen designed the Gyroglider as a means to introduce aviation enthusiasts to the thrills of flight with minimal cost. The pilot relied on an automobile to pull the aircraft aloft. The movement of air through the rotor disc caused the blades to autorotate, which provided lift. 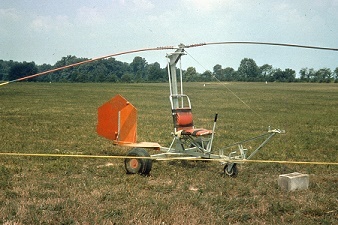 Available in the form of a complete kit or as a set of drawings, it was the first gyrocopter of simple design and construction that can be built by homebuilders. Basically, the machine is as lightweight tubular aluminum structure with fin and rudder in plywood. The rotor blade is made of laminated plywood and is titled by a stick to control direction of flight. Hundreds of kits and drawings have been sold and some were even used by the USAF as the X-25B. 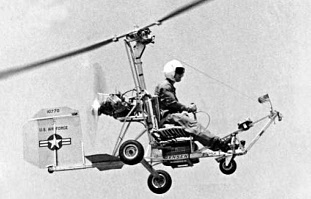 A powered version, called B-8M Gyro-Copter, flew in July 1957. The engine installed on the mast behind the pilot was a flat four McCulloch 4318 or a 1600cc Volkswagen engine. Some machines were fitted with floats and known as Hydro-Copter. Although many examples were built in Belgium and registered officially, the machine displayed in BAPA’s workshop comes from Luxembourg where it was built by Mr Jean Villiet.